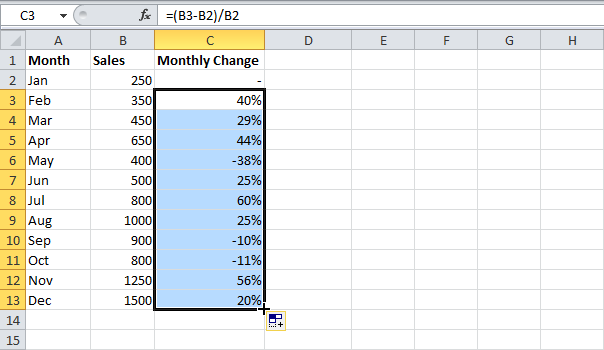 The percent change formula is used very often in Excel. 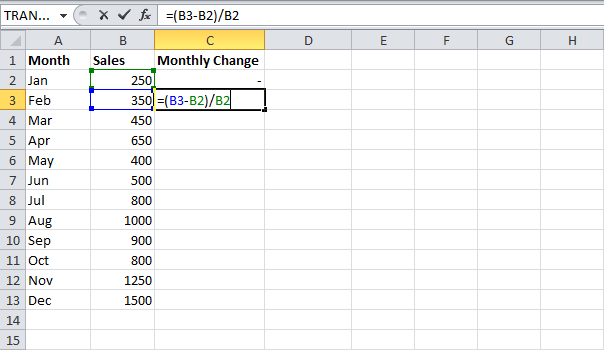 For example, to calculate the Monthly Change and Total Change. 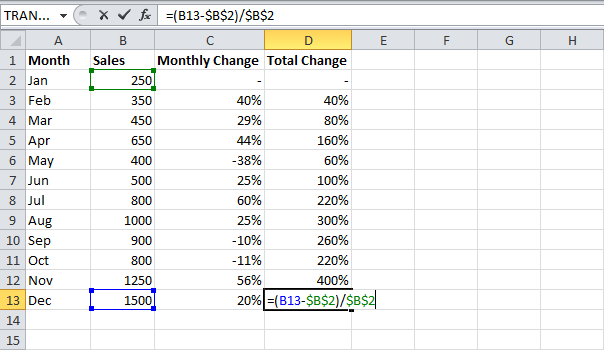 In this step by step guide we will show you how to use percent change formula in excel. 1a. Select cell C3 and enter the formula shown below. 1b. Select cell C3 and apply a Percentage format. We don't need to repeat step 1a and step 1b ten more times. 1c. Select cell C3, click on the lower right corner of cell C3 and drag it down to cell C13. 1d. Check if everything went alright. 2a. In a similar way, we can calculate the Total Change. This time we fix the reference to cell B2. 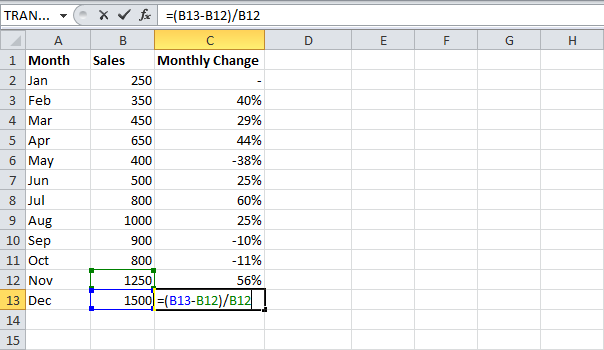 Select cell D3 and enter the formula shown below. 2b. 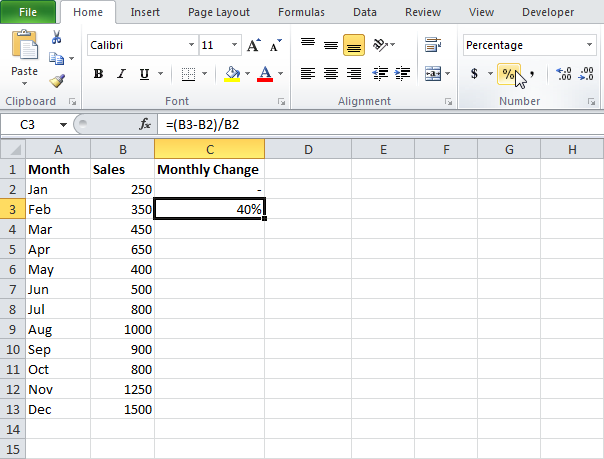 Select cell D3 and apply a Percentage format. 2c. Select cell D3, click on the lower right corner of cell D3 and drag it down to cell D13. 2d. Check if everything went alright. 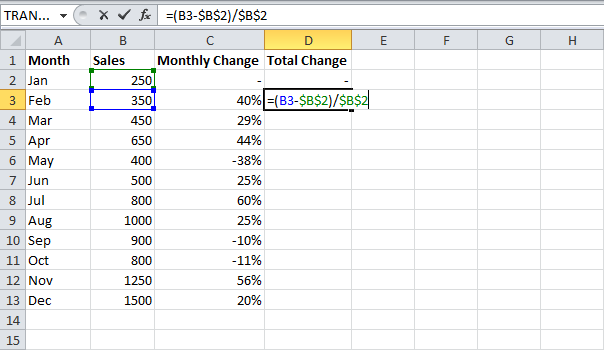 Explanation: when we drag the formula down, the absolute reference ($B$2) stays the same, while the relative reference (B3) changes to B4, B5, B6, etc. 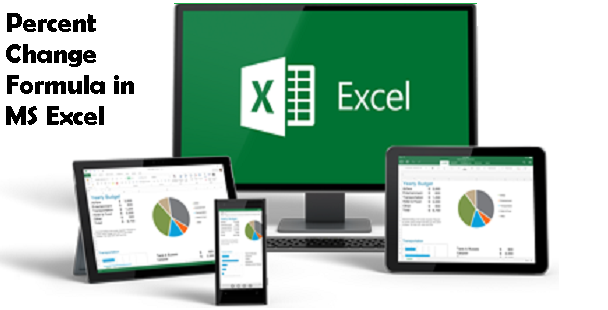 Maybe this is one step too far for you at this stage, but it shows you one of the many other powerful features Excel has to offer.